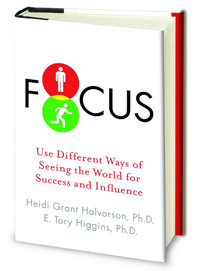 On June 21, 2013, we had an engaging Q&A Interview with one of the leading experts in motivational psychology, Heidi Grant Halvorson, PhD, co-author of the new book Focus: Use Different Ways of Seeing the World for Success and Influence. TO RECEIVE THE RECORDING AND ADDITIONAL MATERIALS, fill out the form below. There are two kinds of pleasure and pain that are associated with the basic human needs of being nurtured and being safe. Promotion motivation is about satisfying our need for nurturance, filling life with positives like love and admiration, as well as accomplishment, advancement, and growth. When we get to the positive things we’ve been seeking, we feel the high-energy, cheerfulness-related emotions: happiness, joy, and excitement. Prevention motivation is about satisfying our need for security and safety, about doing what’s necessary to maintain a satisfactory life and doing what’s right. When we successfully maintain safety and security, we feel the low-energy, quiescence-related emotions: calmness, relaxation, and relief. If you are promotion-focused, you want to advance and avoid missed opportunities. If you are prevention-focused, you want to minimize losses and keep things working. Tory Higgins discovered in his groundbreaking research that if you understand how people see the world in terms of promotion or prevention, you have the power to motivate yourself and everyone around you. Differentiating between a promotion and a prevention focus allows us to understand what lies underneath our motivation and how we can match our strategies to our motivational style for more successful goal achievement. The authors explore applications across a wide range of situations from selling products to managing employees to raising children to getting a second date. Halvorson and Higgins show how we can identify focus in ourselves and others, and then how and when to shift our focus to get the results we want. 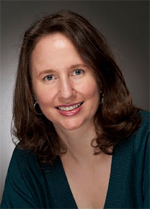 ABOUT HEIDI GRANT HALVORSON, Ph.D.
Heidi Grant Halvorson, Ph.D., is a social psychologist, consultant, and rising star in the field of motivational science. She received her PhD in Social Psychology from Columbia University and is currently the Associate Director of the Motivation Science Center at the Columbia University Business School. She has the honor of having been elected to the highly selective Society for Experimental Social Psychology. She speaks regularly at national conferences, and applies her expertise as a consultant to the fields of education, marketing, and management. She has received numerous grants from the National Science Foundation for her research on goals and achievement. Heidi writes weekly as an Expert Blogger for Fast Company, The Huffington Post, and Psychology Today, and is a regular contributor to the BBC World Service’s Business Daily, the Harvard Business Review, and SmartBrief’sSmartBlog on Leadership. Her writing has also been featured on CNN Living and Mamapedia. Drawing on her strong academic and research background, Heidi has focused on communicating the results of motivational science to a wide variety of audiences, giving them practical strategies and understanding for successful goal achievement. In addition to her work as author and co-editor of the highly-regarded academic book The Psychology of Goals(Guilford, 2009), Heidi has authored papers in her field’s most prestigious journals, including the Journal of Personality and Social Psychology, Journal of Experimental Social Psychology, Personality and Social Psychology Bulletin, European Journal of Social Psychology, and Judgment and Decision Making. Her research and writing have received high praise from academics, business leaders, and authors including Carol Dweck and Matthew Kelly. In 2010, Dr. Grant Halverson published Succeed: How We Can All Reach Our Goals, which has emerged as a “must-read” for individuals, groups, and managers focused on success or in a position to help others achieve their goals. It is filled with fascinating, easily readable research studies that highlight research-based strategies for success, and offers lists of recommendations for applying them to personal achievement and business settings. Dr. Grant Halvorson’s book, Nine Things Successful People Do Differently, is in the form of a Harvard Business Review eSingle, She provides laser highlights on the strategies commonly used by truly successful people which include setting highly specific goals, seizing the moment to act on them, gauging just how far away the goal is, adopting the best attitude, finding the best focus and outlook, and building willpower and determination that will fuel achievement. A delightful trailer for Heidi’s new book, Focus: Use Different Ways of Seeing the World for Success and Influence. “Do You Play to Win-or to Not Lose?” The Harvard Business Review March 2013. Assessment tool for Understanding How You Focus. Heidi’s website, blog, and favorite links on the science of success are here. Heidi’s Harvard Business Review Blogs. A recording of Heidi talking about her e-book Nine Things Successful People Do Differently. The e-book is here.